Avg. Group Discount of 26.8%! Our military veterans group enjoyed our stay at the Hotel Indigo. Staff was so friendly, helpful and just couldn't do enough to make our stay the highlight it was. Thank you all. Beautifully decorated. 15-Jun-2018 Verified Review, stayed from Sun Jun 10 to Thu Jun 14 2018 at a $117.00 group rate (33% discount). Pool Info: We do not have a pool. Savannah International Airport is located 14 miles west of the Historic District. Current airlines include Delta, Us Air, Continental, United Express, Northwest, Air Tran. Taxi and Shuttle pick up at the airport. We offer valet parking only. We can accommodate a tour bus drop off, however, Savannah has specific parking for buses. We offer complimentary internet access throughout the hotel. The graph above is trends of room rates for both group/meeting quotes and the lowest online individual prices we could find at the time the group/meeting offer was entered. 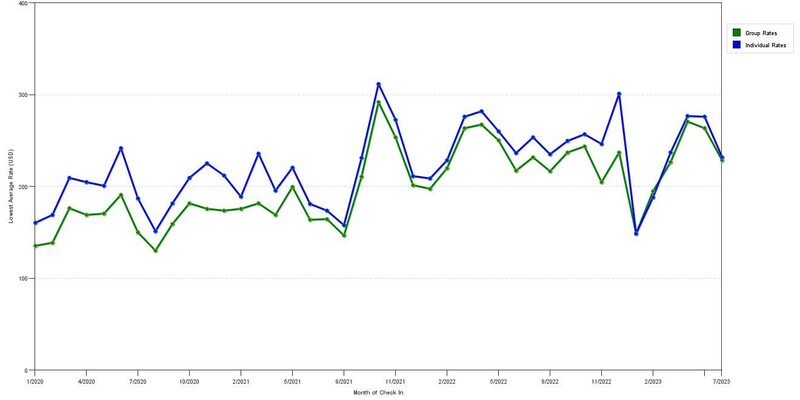 The most competitive group or meeting displayed is 33.4% in the month of July 2019 and the highest average individual rate is $345 in the month of April 2019. This chart will show past seasonality and also project future months. If you are flexible with dates, you may want to consider staying at Hotel Indigo Savannah Historic District in a month when rates are lower. 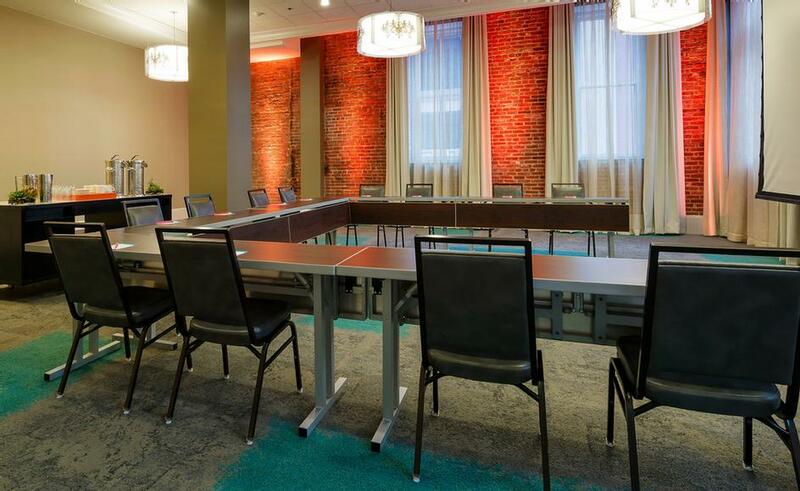 Below are the meeting, banquet, conference and event spaces at Hotel Indigo Savannah Historic District. Feel free to use the Hotel Indigo Savannah Historic District meeting space capacities chart below to help in your event planning. 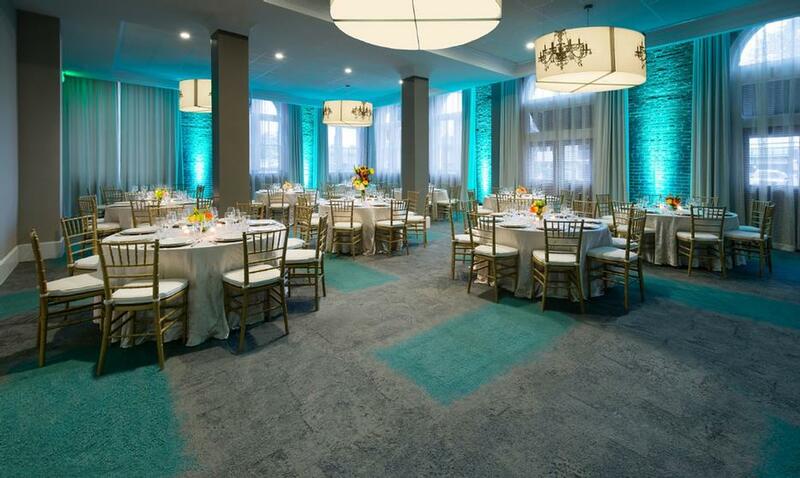 Hotel Planner specializes in Savannah event planning for sleeping rooms and meeting space for corporate events, weddings, parties, conventions, negotiated rates and trade shows. The Oglethorpe Room is quaintly decorated in traditional Southern style. Very warm and comfortable. 35 x 23 x 9 Ft.
Our distinctive spaces with exposed brick, high ceilings, natural light, and custom murals will infuse your next event with character and inspire creativity. Catering from Savannah’s premier Chef, Chris Nelson is locally sourced and seasonally-inspired. Our distinctive spaces with exposed brick, high ceilings, natural light, and custom murals will infuse your next event with character and inspire creativity. Catering from Savannah’spremier Chef, Chris Nelson is locallysourced and seasonally-inspired. 32 x 47 x 22 Ft.
Our distinctive spaces with exposed brick, high ceilings, natural light, and custom murals will infuse your next event with character and inspire creativity. Catering from Savannah’spremier Chef, Chris Nelson is locally sourced and seasonally-inspired. 32 x 32 x 22 Ft.
14 x 15 x 22 Ft.
22 x 23 x 12 Ft.